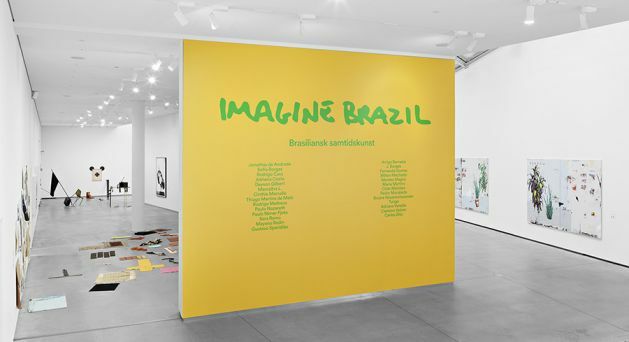 Astrup Fearnley Museet presents, Imagine Brazil, an exhibition of Brazilian contemporary art, with a particular focus on the young, emerging art scene. After extensive research, the curators have selected 14 young artists of international significance who are important representatives of the vibrant emerging art scene in Brazil. In order to situate their work in a historical context, each was asked to choose an older artist whom they consider important for Brazilian contemporary art or for their own work, for presentation in an exhibition within the exhibition. The selected young artists are proposing new artistic languages in order to develop urgent subject matter. They have dived into the multitude of possible media offered by conceptually based works, including painting, sculpture, installation, photography, video and music, using a variety of languages, complex research and experimentation with words, materials and structures to embody their ideas. They also show a strong awareness of social engagement and issues related to political and environmental problems, without ever neglecting the formal aspects that give the work of art its visual impact and originality. As another exhibition within the exhibition, there is also a presentation of artist’s books – a collaborative art form that has always played an important role in Brazil. Curators of this section are Jacopo Crivelli Visconti and Ana Luiza Fonseca. Participating artists: Marlon de Azambuja, Chiara Banfi, Artur Barrio, Debora Bolsoni, Waltercio Caldas, Felipe Cohen, Marilá Dardot, Detanico/Lain, Ana Luiza Dias Batista, Marcius Galan, João Loureiro, Milton Marques, Lucia Mindlin, Leya Mira Brander, Fabio Morais, Carlos Nunes, Nicolás Robbio, Lucas Simoes, Gustavo Speridião. Each of the artists whose work is featured in the show is introduced by a text on their work. However, since this selection of artists provides only a partial glimpse of Brazil’s rich and complex artistic landscape, the catalogue attempts to present a fuller picture. The Brazilian art scene is introduced by curator and art critic Kiki Mazzucchelli, who is based in London and provide an outsider ́s perspective of the art scene. In order to convey the many variable art scenes across the country’s different regions, specific overviews of the cultural activities in the cities of Rio de Janeiro and São Paulo, as well as Brazil’s five regions from north to south, east to west, are presented in separate texts by seven different authors. The catalogue is designed by Rune Døli.